This is an inexpensive casserole that is quick to put together, and tastes great. 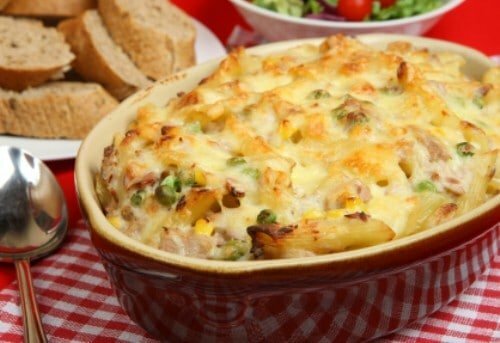 Tuna noodle casserole is the perfect comfort meal. Preheat oven to 350 degrees. In a large bowl, combine noodles, tuna and mushrooms. Combine soup, milk, salt and pepper; pour over noodle mixture and mix well. Pour into a greased 2 quart baking dish. Combine saltines and butter and sprinkle over noodles. Bake for 35 to 45 minutes or until heated through. Hey, I see peas in there!